The cosmological constraints on the fractional contribution of matter to the energy budget of the universe (the rest of it corresponds to dark energy), and the clumpiness of the matter distribution today as inferred from the analysis of the 3d dark matter map. The results of the clumpiness of the matter distribution from HSC observations of the distant universe using weak gravitational lensing are consistent with results from other similar observations (Dark Energy Survey and the Kilo Degree Survey) of more nearby universe. The results from the cosmic microwave background observations during the universe’s infancy obtained by the Planck satellite are shown in blue. Cosmological constraints on the dark energy equation of state: blue contours alone from HSC, red contours correspond to constraints after combining with cosmological results from the Planck CMB satellite and other contemporary cosmological measurements. 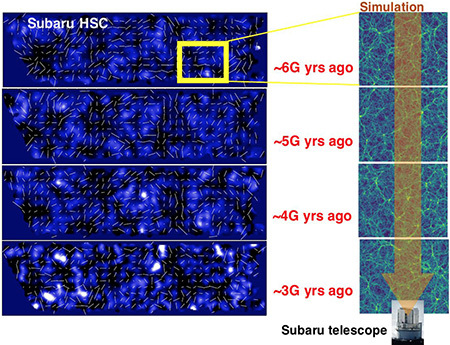 Using the powerful Japanese Subaru telescope, the Hyper Suprime-Cam (HSC) survey collaboration team has made and analyzed the deepest wide-field map of the three-dimensional distribution of matter in the universe. The results place new constraints on the nature of the mysterious dark energy that is accelerating the expansion of the universe, said Alexie Leauthaud, assistant professor of astronomy and astrophysics at UC Santa Cruz and a member of the international collaboration. The HSC survey, led by the astronomical communities of Japan and Taiwan and Princeton University, is an unprecedented effort to measure gravitational lensing, in which the gravity of a galaxy in the foreground of an image bends the light from a more distant galaxy as it passes by. Gravitational lensing can reveal dark matter, which accounts for about 80 percent of the mass in the universe but cannot be observed directly. Leauthaud has been involved in the survey from the beginning, joining the project when she was at the Kavli Institute for the Physics and Mathematics of the Universe (IPMU) at the University of Tokyo, before she joined the faculty at UC Santa Cruz. She helped to write the proposal that secured 300 nights for the survey on the Subaru telescope and has provided expertise with weak lensing measurements and performed critical data quality checks. A team of scientists led by Chiaki Hikage at the Kavli IPMU has now used the gravitational distortion of images of about 10 million galaxies to make a precise measurement of the lumpiness of matter in the universe. By combining this measurement with observations of the cosmic microwave background by the European Space Agency's Planck satellite and other cosmological experiments, the team has been able to further constrain dark energy. "Taken together in the context of other weak lensing data sets, the hints of a deviation from Planck are very intriguing," Leauthaud said. "It is exciting to see what we have been able to achieve this early on in our survey. With our full data set, we will have the power to say whether or not there is a tension with Planck. That is incredibly exciting to me because we may be on the verge of learning something very interesting about the physics of dark energy." Though quite weak, the gravitational lensing effect results in small but measurable distortions in the images of distant galaxies. Like a pointillist painting, the distorted images of millions of galaxies located further and further away paint a three-dimensional picture of the distribution of matter in the universe. The research team has characterized the precise amount of fluctuations in the matter distribution and their change over billions of years, from the universe's adolescence to its adulthood. The study required precise measurements of galaxy shapes. Since the weak lensing effect is quite small, the HSC team had to control various problems affecting the measurement of shapes, such as distortions due to the atmosphere and the instrument itself. The team overcame these difficulties by using detailed painstaking image simulations of the HSC survey based on Hubble Space Telescope images. When carrying out precise measurements of very small effects, it is known that people have a tendency to decide that their analysis is complete if their results confirm earlier results. The HSC team performed a so-called blind analysis of their data in order to avoid such “confirmation bias.” They carried out many tests of their catalogs for more than a year without ever seeing the actual values of cosmological parameters from their analysis or comparing with results from other experiments. The HSC weak lensing measurement is used to determine the lumpiness of matter in the universe, quantified by a parameter called S8. Larger S8, for example, would mean more structure such as galaxies in the universe. With the high-precision HSC data, the team determined S8 with a precision of 3.6 percent, which is similar to the precision with which it was measured by the weak lensing analysis from the Dark Energy Survey (DES). The DES surveyed​ ​14 times more area on the sky than HSC, but focused on the more nearby universe. With a deeper survey that images even fainter galaxies, the HSC team was able to map out a sharper dark matter distribution than was previously possible and achieved a similar precision measurement with a smaller area. This showcases the strength and complementarity of HSC among ongoing projects worldwide. 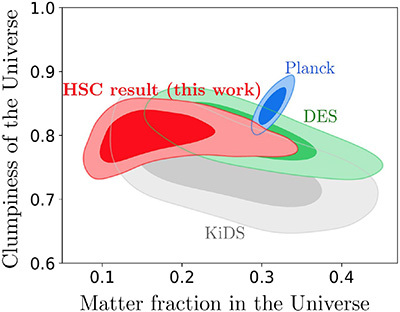 When compared to the fluctuations expected from those seen in the universe’s infancy by the Planck satellite, the HSC measurements offer a consistent picture of the cosmological model. The universe today is dominated by dark matter and dark energy, and that dark energy behaves like Einstein’s cosmological constant—the simplest model. 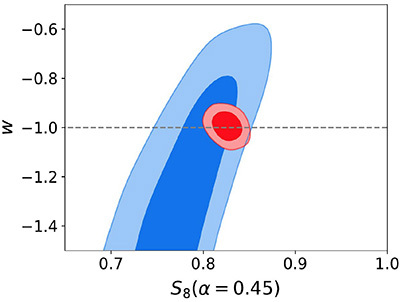 However, taken together the results from weak lensing surveys prefer a slightly smaller value of fluctuations than that predicted by the Planck satellite. This could just be a statistical fluctuation due to the limited amount of data, or it might be a signature of the breakdown of the standard model of the universe based on general relativity and the cosmological constant. The new HSC results come from a mere one tenth of the planned survey. When completed, the survey has the potential to deepen scientists' understanding of the standard cosmological model by shedding light on the behavior of dark energy. The research paper has now been submitted to the journal ​Publications of the Astronomical Society of Japan​ and will undergo rigorous peer review by the scientific community. The HSC survey began in the spring of 2014 using the National Astronomical Observatory of Japan’s Subaru telescope located at the summit of Mt. Maunakea on the Big Island of Hawaii. The telescope features a large collecting area corresponding to a diameter of 8.2 meters, a wide angle camera that fits an area equal to about 9 moons in a single shot, and superb image quality, making it well suited to conduct a wide yet deep imaging survey of the sky. The survey has covered about 140 square degrees of sky (the area of 3,000 full moons) over 90 nights on the telescope​.